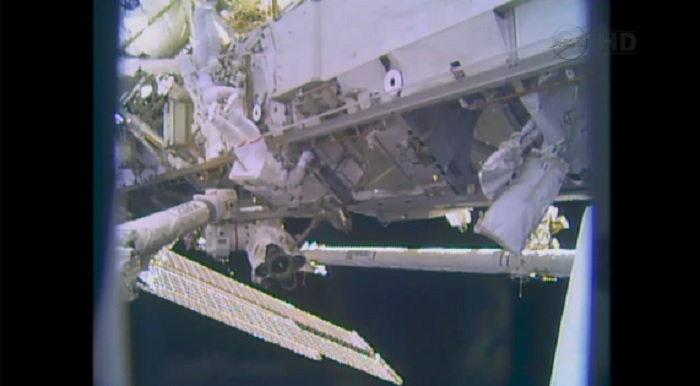 Two NASA spacewalkers started fixing the International Space Station's cooling system more quickly than expected on Saturday, with no sign of the helmet-flooding problem that led NASA to outfit astronauts with snorkels for the first time. 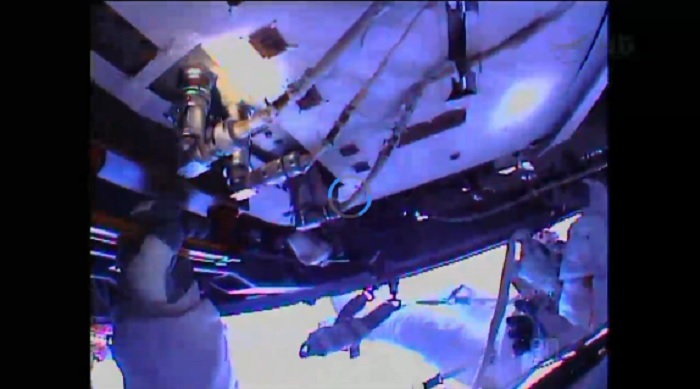 Astronauts Rick Mastracchio and Mike Hopkins finished the first of three planned spacewalks in five and a half hours — an hour ahead of schedule. They moved so quickly that they got extra work done, stowing away a coolant pump module with a faulty valve to make room for its replacement. 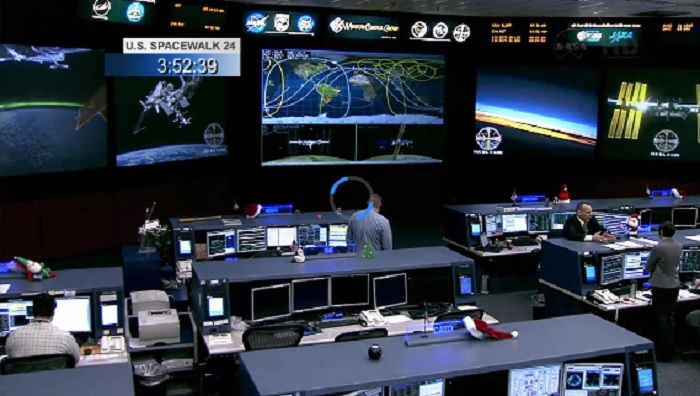 And if their next spacewalk goes as smoothly on Monday, they could dispense with the third outing and take Christmas Day off. 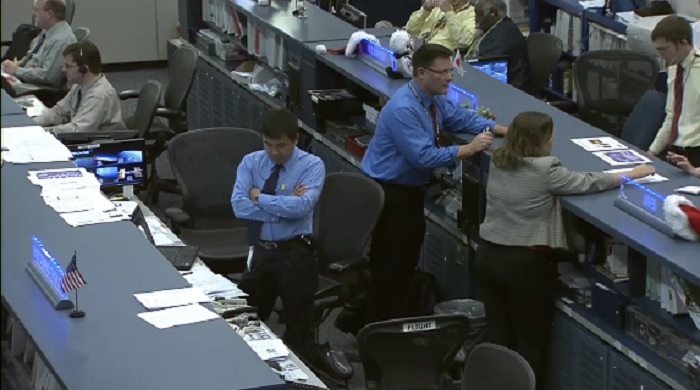 "Really nice work, guys," fellow NASA astronaut Doug Wheelock told the dynamic space duo from Mission Control. Wheelock was involved in a similar pump replacement operation in 2010. Last week's valve malfunction cut the station's cooling capability in half, forcing mission managers to shut down non-critical systems on the $100 billion-plus orbital outpost. 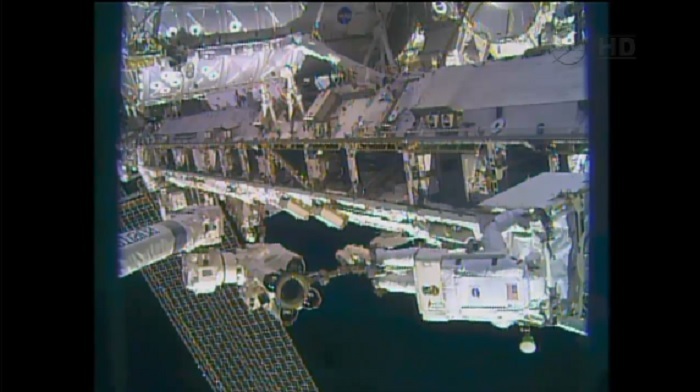 Ground controllers couldn't get the valve back in service by remote control, which led to the plan for three spacewalks. 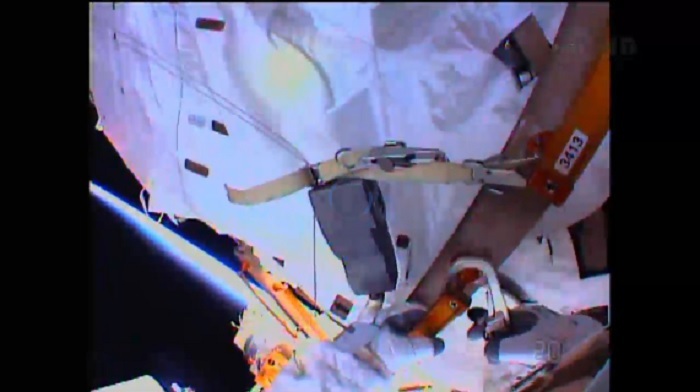 Replacing the refrigerator-sized pump module is one of the station's expected maintenance tasks — but the job has been complicated by the fact that an Italian spacewalker, Luca Parmitano, almost drowned in July when water pooled in the helmet of his U.S.-made suit. 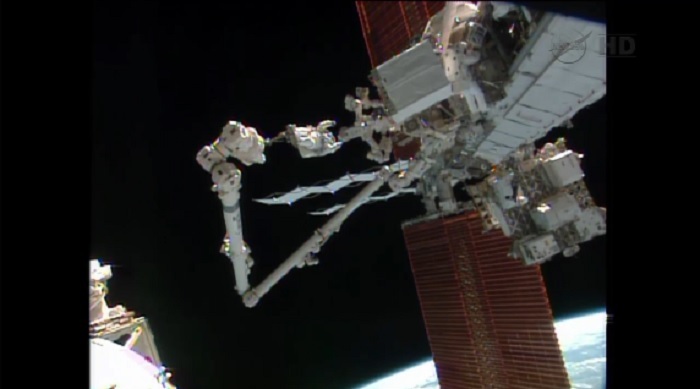 That incident led NASA to suspend U.S. spacewalks while the station's crew and controllers worked to track down the source of the problem. 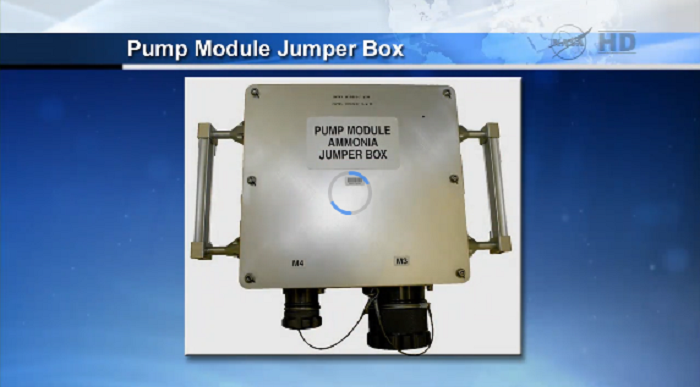 They think they've identified the cause: previously undetected contamination that clogged up the system designed to remove moisture from the suit. 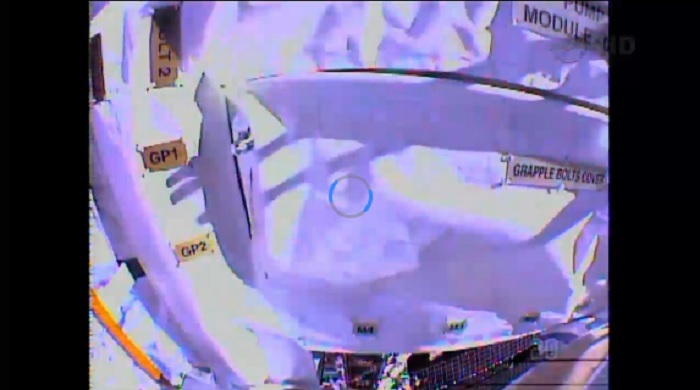 And they gave a clean bill of health to the spacesuits Mastracchio and Hopkins are using. But just to be safe, the astronauts wore absorbent pads on their necks that should have picked up the first signs of excess moisture in the helmet — and they were primed to stop the spacewalk if those pads started feeling squishy. They also had jury-rigged snorkel tubes within easy reach of their mouths in the event that water started to cover their faces. Mastracchio and Hopkins told Mission Control they didn't feel a bit of squishiness, raising the confidence level for future spacewalks. 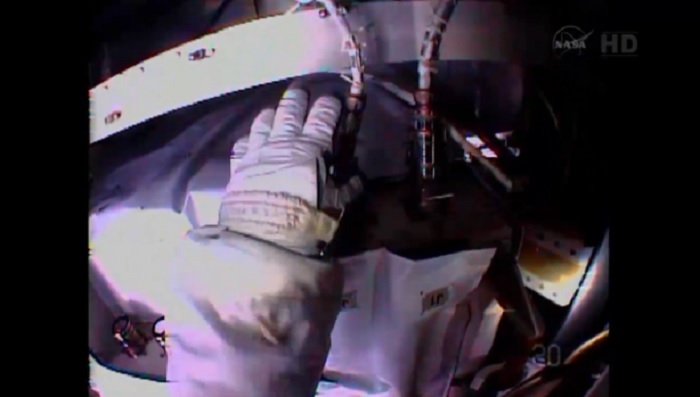 This was the seventh career spacewalk for Mastracchio — and the first one for Hopkins, who wore the suit that Parmitano used in July. 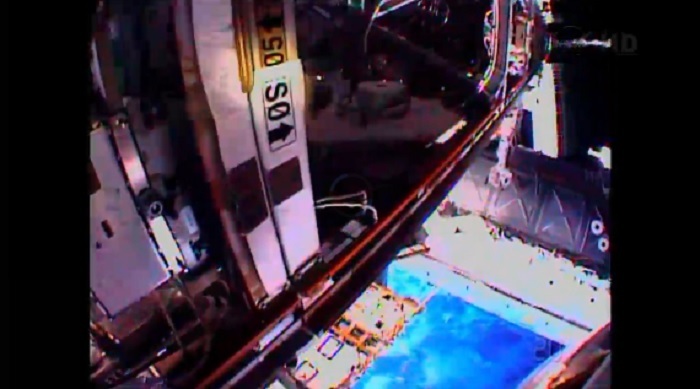 During Saturday's outing, they disconnected cables and fluid lines attached to the faulty pump module, and hooked up a jumper box to keep the liquid ammonia coolant from leaking out. That took care of all the originally assigned duties. 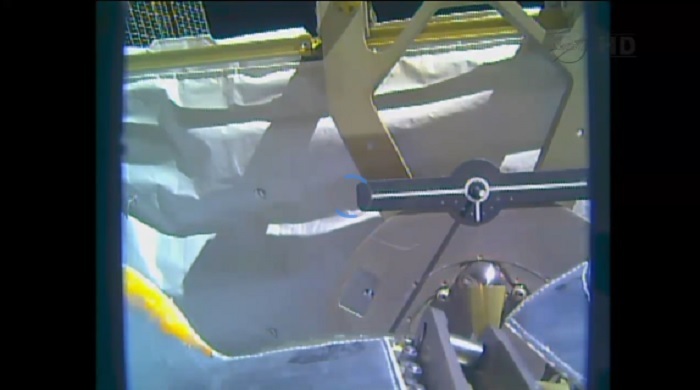 Then, with Mission Control's go-ahead, they pulled out the pump module and hooked it onto a storage fixture. 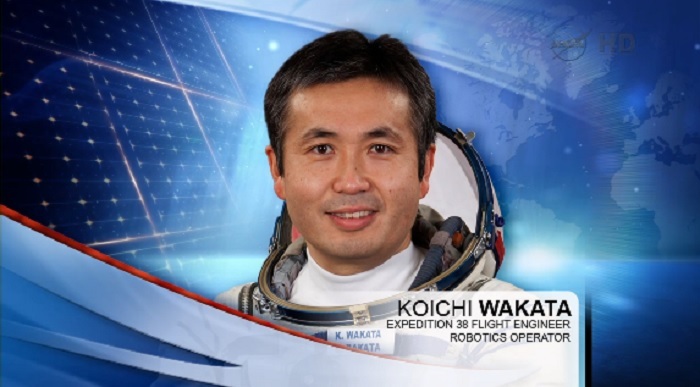 Japanese astronaut Koichi Wakata helped out from inside the station by operating the 58-foot-long (18-meter-long) robotic arm. One of the potential perils that the spacewalkers faced was exposure to toxic ammonia. At one point, Mastracchio reported that some "very small flakes" of frozen ammonia floated out of one of the fluid lines and landed on his spacesuit. 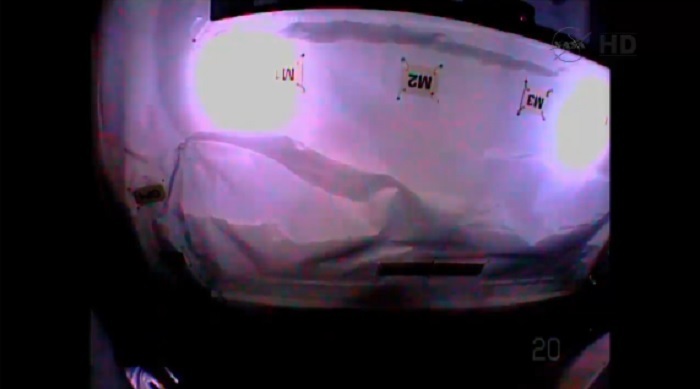 Fortunately, the ammonia contamination was "baked out" of the suit through exposure to sunlight. 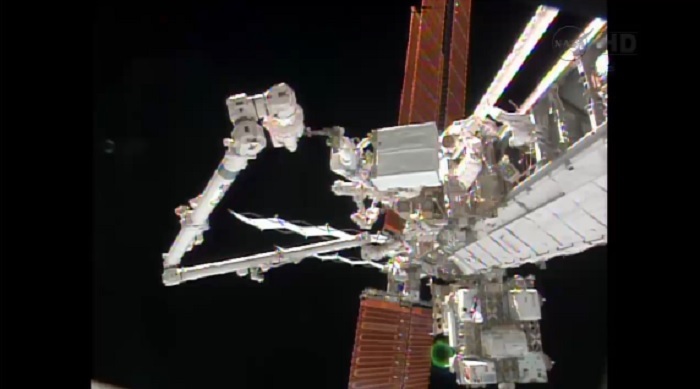 Mission Control told the spacewalkers they could start preparations to install the spare pump module if they wanted to, but Mastracchio said he preferred to "call it a day." 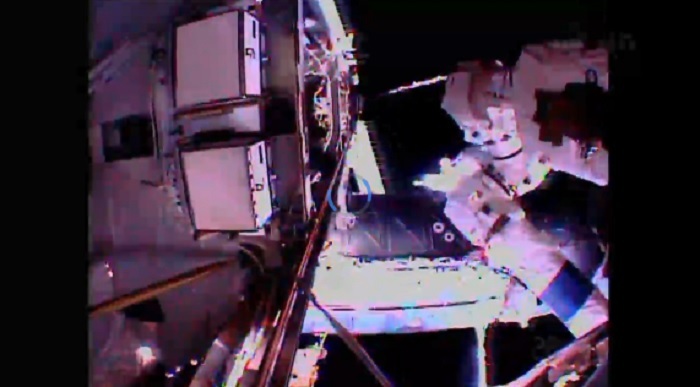 The spacewalk, which was originally planned to last six and a half hours, ended at 12:29 p.m. ET — five hours and 28 minutes after it began. 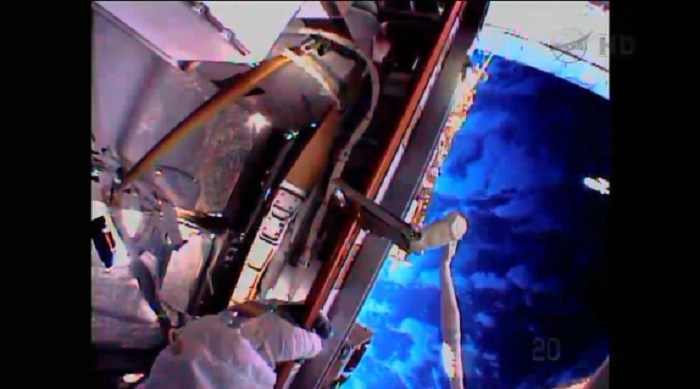 During Monday's spacewalk, the astronauts are scheduled to install the spare pump module, which has been in storage on the space station's exterior. 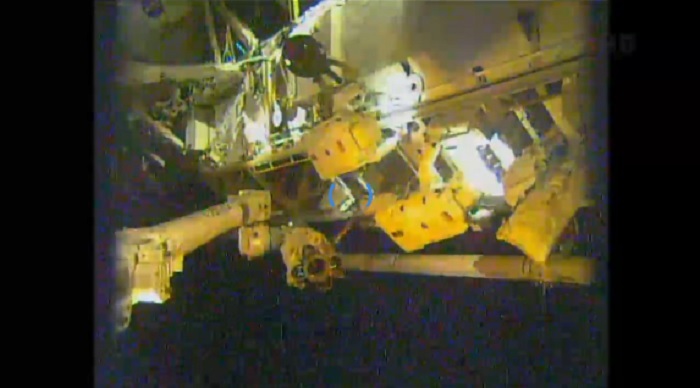 Because they were able to work ahead on Saturday, they may be able to finish the repair job in two spacewalks and forget about the third one on Christmas Day. 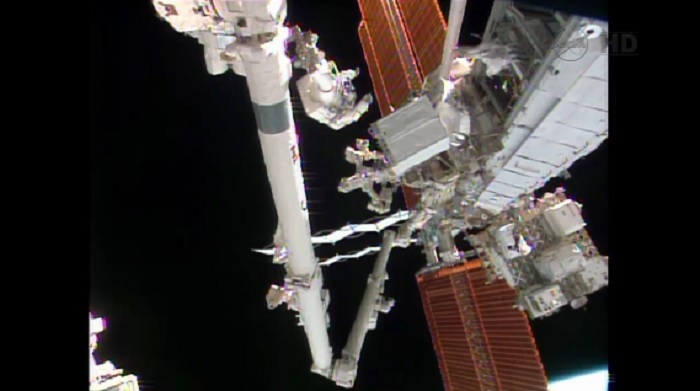 One lighthearted exchange reflected the holiday spirit: When Mastracchio grabbed hold of a ring that was part of the pump module assembly, Wheelock told him, "Don't let that go — that's a stocking stuffer." "Don't tell my wife," Mastracchio replied. 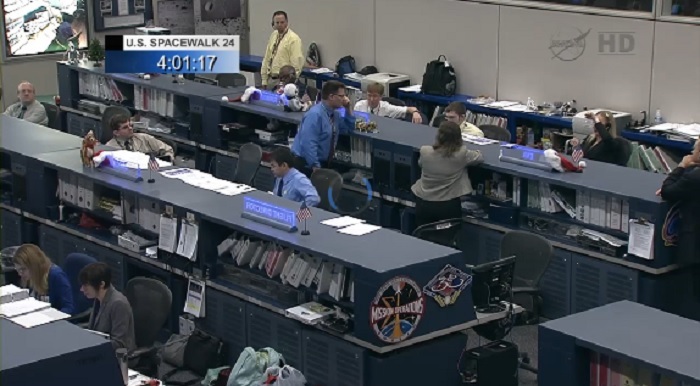 The cooling system problem poses no immediate danger to the crew, but it does reduce the safety margin on the station. If the second coolant loop were to fail, urgent action would be required — and in a worst-case scenario, the station would have to be abandoned. 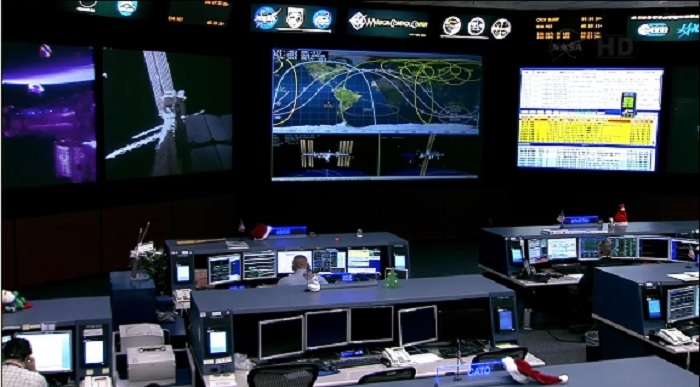 The situation already has forced NASA to delay the launch of a cargo resupply mission until Jan. 7 at the earliest. 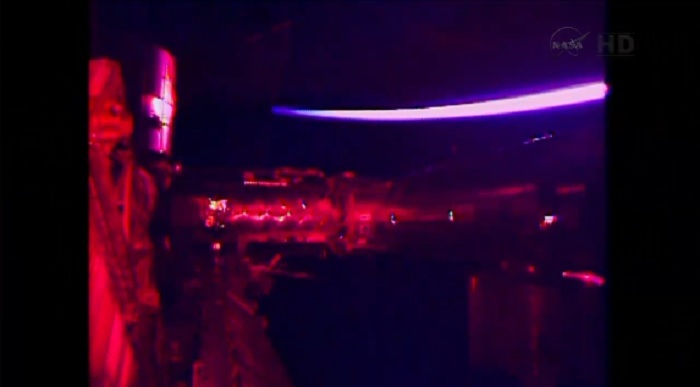 NASA sources say they are also studying whether last week's glitch resulted in damage to Europe's Columbus laboratory. 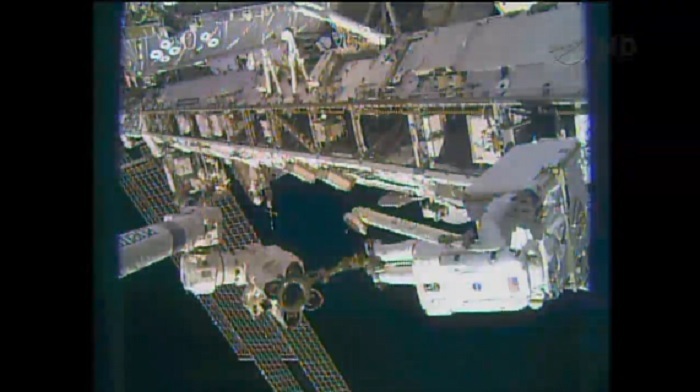 And as if the six-man crew didn't have enough to worry about, NASA reported in an advisory that one of the toilets on the station has broken down. In addition to Hopkins, Mastracchio and Wakata, the space station is home to three Russian cosmonauts: station commander Oleg Kotov, Mikhail Tyurin and Sergey Ryazanskiy. The 450-ton structure has been continuously occupied since 2000.